Welcome to visit jtfurnace dot com. please email to jtfurnace at hotmail dot com. Hot Log Shears is applied to aluminum billets hot shearing, and apply to the use of matching extrusion machine. Advantages: 1. 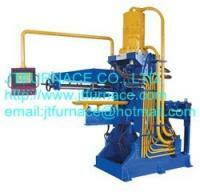 The equipment is mainly composed by the hot shear machine, Hydraulic Station, electric control and so on. 2. Lubricate, test billet automatically, feeding billet to extrusion press automatically 3. Controlled by PLC, operated by touch-screen 4. Diameter of billet: D70mm-D300mm 5. Shearing length: 250mm-1000mm 6. Production period: 90-200 seconds per time Detailed product specifications, please send email to us jtfurnace at hotmail dot com. Our company is specialized exporter, manufacturer and supplier of China Hot Log Shears in china.